Pure Water Gazette » Is Chlorine in our Water Really Necessary? Do We Have to Have Chlorine in our Municipal Water? The Answer Is Not as Simple as You Think. Disinfecting tap water with chlorine is the norm around the world and we’ve been doing it so long in the United States that we accept it as an essential though sometimes unpleasant fact of life. You may not know that some very advanced countries get along well without chlorinating their water. Although we complain about the taste of chlorine and we’re understood for some time that it certainly has negative health implications, we have been trained to view it as a necessary evil. 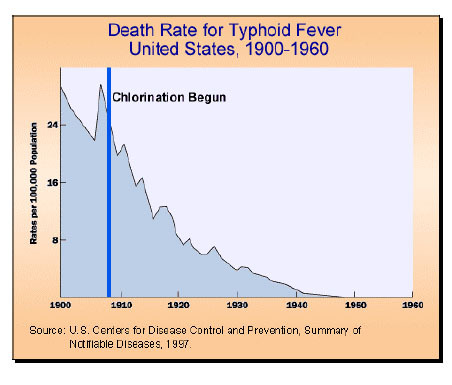 After all, the chlorination of water virtually wiped out water-borne diseases like Typhoid. The benefits of foregoing chlorine include better-tasting and, potentially, healthier water. But without it, we would go back to the age of cholera, right? Distributing tap water with residual chlorine is a century-old strategy used to protect populations by preventing the proliferation of waterborne pathogens. But is it necessary? In a recent commentary published in the journal Science, researchers provide evidence from Europe showing that chlorine could be forgone if other protective barriers are in place. Factors other than the addition of disinfectants determine the quality of tap water. Certainly, the quality of the source of the drinking water is of utmost importance, as is the treatment of the water before its delivery into the distribution network. What is often not considered, though, is the extreme importance of the quality of the distribution network itself. Decades of experience in the Netherlands, Germany, Austria, and Switzerland have shown that, when none of these three elements are compromised, the number of waterborne-disease outbreaks are low, even lower than in countries that add chemical disinfectants to their water supply in order to compensate for poorly maintained networks, insufficient water treatment, or contaminated water sources. But the researchers point out that distributing the water without added chlorine comes at a cost. It requires protecting groundwater sources, properly controlled water treatment, and regular maintenance of the water distribution network. But where chlorine can be foregone, the benefits go beyond improving the taste of tap water. When disinfectants, like chlorine, react with natural organic matter that is always present in drinking water, this can lead to the formation of disinfection by-products, some of which are potential carcinogens. In the United States, failure to support water infrastructure has resulted from misguided efforts to keep taxes and water rates that support water infrastructure ridiculously low. Failure to maintain the sources, treatment plants, and the distribution systems have led to reliance on the cheap fix of dosing our public water with chlorine. It keeps us safe from cholera, but it keeps us from enjoying the really excellent public water available to more advanced societies.